So you’ve made it through all 9 weeks and here we are at the last week. I originally said there would be 9 steps, but turns out there are 10, though you may feel 10 is optional I want you to give it some serious thought. All those statements do is make you a victim. You are NOT a victim. You are a product of all YOUR choices. Dare to disagree with me here. If you don’t like where you are now, change it, do something different. But just whining and wallowing self-pity will continue to keep you where you are. Yes, you may have had less than ideal circumstances in your life. So? Change it. Do it now and start taking responsibility. If you want it, go get it. If you didn’t do it, own it. OWNERSHIP HAS POWER IN IT. The predominant state of mind displayed by those on the failure curve is blame. 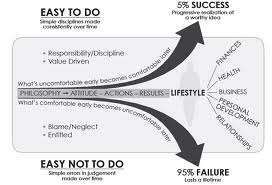 The predominant state of mind displayed by those people on the success curve is responsibility. 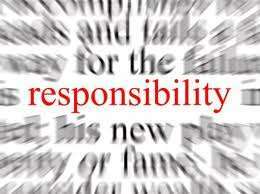 Taking responsibility liberates you; in fact, it is perhaps the single most liberating thing there is. Even when it hurts, even when it doesn’t seem fair. When you don’t take responsibility, when you blame others, circumstances, fate or chance, you give away your power. When you take and retain full responsibility – even when others are wrongÂ or the situation is genuinely unfair – you keep your life’s reins in your own hands. “Responsibility is declaring oneself as cause in the matter. It is a context from which to live one’s life. Responsibility starts with the willingness to deal with a situation from and with the point of view, whether at the moment realized or not, that you are the source of what you are, what you do and what you have. What does this mean? It means having someone generally, that you tell your goals and your plans to and that you will check in with, letting them know your actions. Writing things down is a form of self-accountability. 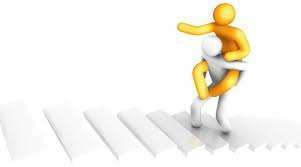 Having an accountability partner is a trusted friend, and you tell them when you have done what you said you would do or when you haven’t done what you said you would do and they hold you accountable. If you say “I will exercise 20 minutes every day, get 8 hours of sleep and cut out all alcohol. Will you hold me accountable?” Your partner will ask you (ideally every day) : Did you exercise? How long did you sleep? Did you drink? And you have to answer truthfully. If you say no, they can get on your case in a loving way to remind you of why. “Wait a minute. How are these simple, everyday actions supposed to create all this wonderful happiness, health and success for me, if they’re all easy to do – if anyone could do them? If these are things anyone can do, why are only 5% successful? Excellent question. Because they’re all easy not to do – and while anyone could do them, most won’t. Every action that any of these goals requires is easy to do. Here’s the problem: every action that is easy to do, is also easy not to do. Why are these simple yet crucial things easy not to do? Because if you don’t do them, they won’t kill you…at least, not today. You won’t suffer, or fail, or blow it – today. Something is easy not to do when it won’t bankrupt you, destroy your career, ruin your relationships or wreck your health – today. What’s more, not doing it is usually more comfortable than doing it would be. But that simple, seemingly insignificant error in judgement, compounded over time, will kill you. It will destroy you and ruin your chances for success. You can count on it. It’s the Slight Edge. That’s the choice you face every day, every hour. A simple, positive action, repeated over time. A simple error in judgement, repeated over time. You can always count on the Slight Edge. And unless you make it work for you, the Slight Edge will work against you.